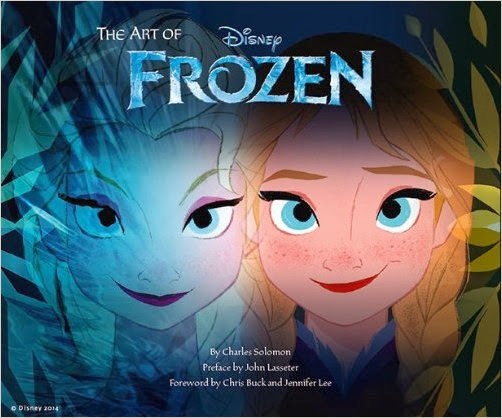 Sasaki Time: Giveaway: The Art of Disney's Frozen Book! Giveaway: The Art of Disney's Frozen Book! Win the awesome Art of Disney's Frozen book! I love it that it doesn't scare me. Yea...I'm thinking this may be a little mixed up...the tweet and question are about Haunted Mansion. However, just incase its on purpose, I'll bite. My favorite thing about Haunted Mansion is the stretching elevator at the beginning of the ride. I haven't seen it yet but my niece loves the movie. Would love to win it for my daughter in law. Love Olaf....so cute and funny. My 10yr old daughter went to see this movie with her 4th grade class as a reward for straight A's the first 18 weeks of school and is now begging me to buy her the book & the movie! She loves it!! The movie is just a great family film for all ages to enjoy. The music in it is enjoyable too. I enjoyed the sisterly bond and the message about love in the movie. It isn't a movie that will scare my child, so I love it. I love that there is a strong female presence in the movie as well. I like that it has two princesses. My twin daughters & I loved Olaf the best in Frozen. He was so funny. I like Olaf and that the princess doesn't rely on someone else to save her. I like the Norwegian details! my grandson would like this. What was there not to love? My favorite thing about Frozen is the music. It's beautiful! Olaf! He was absolutely hilarious! The Music was great as well! I love all the songs!! They were great! And I of course love Olaf, he's so silly!! music..... and my daughter loved it. I haven't seen it yet. I love the commericals and I love the characters. I can't wait to see it. I actually haven't seen it yet but I want to! Giveaway: 2014 Sorcerer Mickey Vinylmation! Giveaway: 2014 Disney Parks Castle XL Tee Shirt! Giveaway: 2014 Disney Parks Castle Coffee Mug! Giveaway: Win a $100 Disney Gift Card! Giveaway: Haunted Mansion Tombstone Coasters! Giveaway: Star Wars Wampa Hat! Giveaway: Win this Awesome LEGO Coffee Mug! Giveaway: Back To The Future Ice Cube Tray! Giveaway: Applebee's $50 Gift Card! Giveaway: IHOP $50 Gift Card! Giveaway: Red Robin $50 Gift Card! Giveaway: AMC Theatres $50 Gift Card! Giveaway: $100 Toys R Us Gift Card! Giveaway: $100 Best Buy Gift Card! Giveaway: $100 Gamestop Gift Card! Restaurant Preview: Solita in Huntington Beach! Giveaway: Star Wars R2-D2 Nutcracker! Giveaway: Rubik's Cube Drink Coasters! Giveaway: Star Wars Death Star Ice Cube Maker! Giveaway: Yahtzee Doctor Who Edition! Movie Review: Saving Mr. Banks! Giveaway: Star Wars The Complete Saga on blu-ray! Giveaway: LEGO Star Wars X-Wing Fighter! Giveaway: LEGO Star Wars Battle of Hoth! Blu-Ray Review: The Lone Ranger! Giveaway: Sephora $25 Gift Card! Giveaway: Lego Back To The Future DeLorean! Giveaway: XBOX One Video Game System! Giveaway: Target $100 Gift Card! Giveaway: Olaf Plush from Disney's Frozen! Giveaway: Visa $100 Gift Card! Giveaway: Anna Toddler Doll from Disney's Frozen! Giveaway: Singing Olaf from Disney's Frozen! Giveaway: Elsa Toddler Doll from Disney's Frozen! Giveaway: Sven Plush from Disney's Frozen! Giveaway: Nintendo 3DS XL Legend of Zelda Bundle! Giveaway: Mary Poppins Mini Carpet Bag! Giveaway: Mary Poppins on Blu-Ray! Giveaway: The Little Mermaid on blu-ray! Giveaway: $50 iTunes Gift Card! Giveaway: $50 Gift Card to Hickory Farms! Giveaway: Starbucks $50 Gift Card! Giveaway: Alice In Wonderland Shoe Ornament! Giveaway: Monsters University Sulley Ornament! Giveaway: Perry The Platypus Ornament! Giveaway: $100 Walmart Gift Card! Giveaway: Two $50 Amazon Gift Cards! Giveaway: It's A Small World Hawaii Singing Doll! Giveaway: $25 Gift Card to Kohl's! Giveaway: $50 Gift Card for TGI Friday's! Giveaway: $50 Gift Card to Forever 21! Giveaway: $50 Gift Card for EXPRESS! Giveaway: Disney Infinity Starter Kit for PS3! Giveaway: Madden 25 for PS3 or XBOX 360!